Five of us put together this amazing puzzle while we were visiting my brother in New Hampshire last week. My brother, sister, sister-in-law, sister-in-law’s nephew and I. Mr. Aitch and Mr. Are (my brother-in-law) cheered us on. The puzzle has irregular edges. It was in the shape of a frog. The pieces were not the typical shaped pieces either. There were frogs, fish, mermaids, sharks, at least one seahorse, buffalo, birds, and many other fun shapes. Sorry, no separate photos of those but you can make out some of those shapes below. 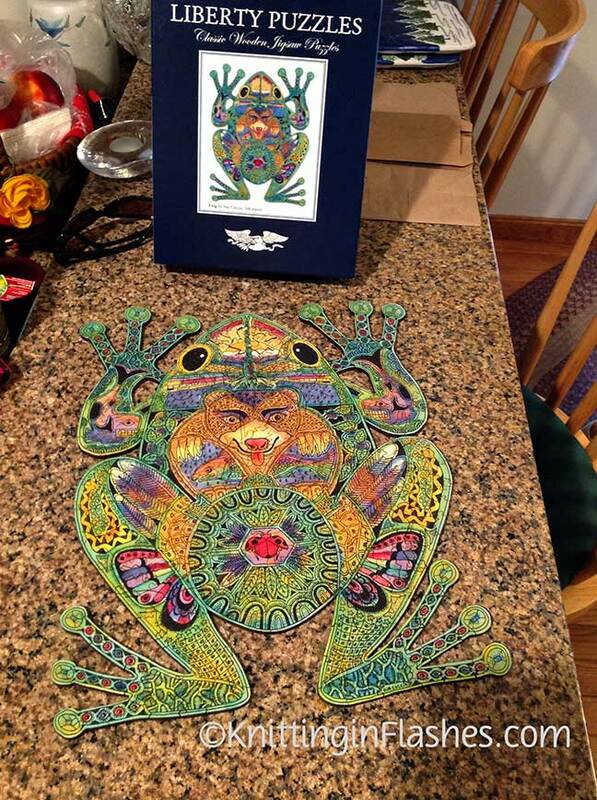 The puzzle called “Frog” by Sue Coccia and is produced by Liberty Puzzles. Their logo piece is an eagle with the word “Liberty” on the back. The cut pattern for this puzzle is different from the one currently one their website. As we started oohing and awing over the various shapes Sunday afternoon, my sister kept saying “It’s too hard. It’s too hard.” But we persevered. And by Tuesday afternoon it was complete. The amusing, whimsical shapes and family interaction were extraordinary. What fun group activities does your family do? 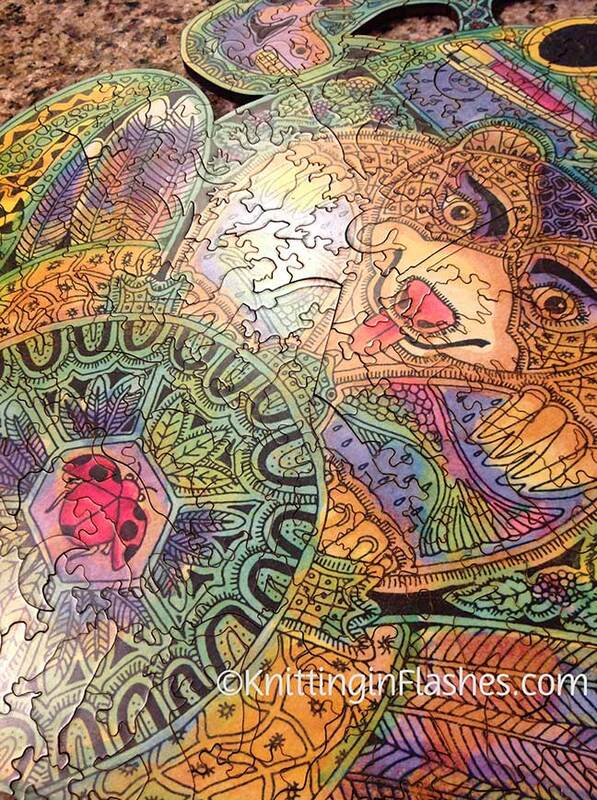 Do you like jigsaw puzzles? 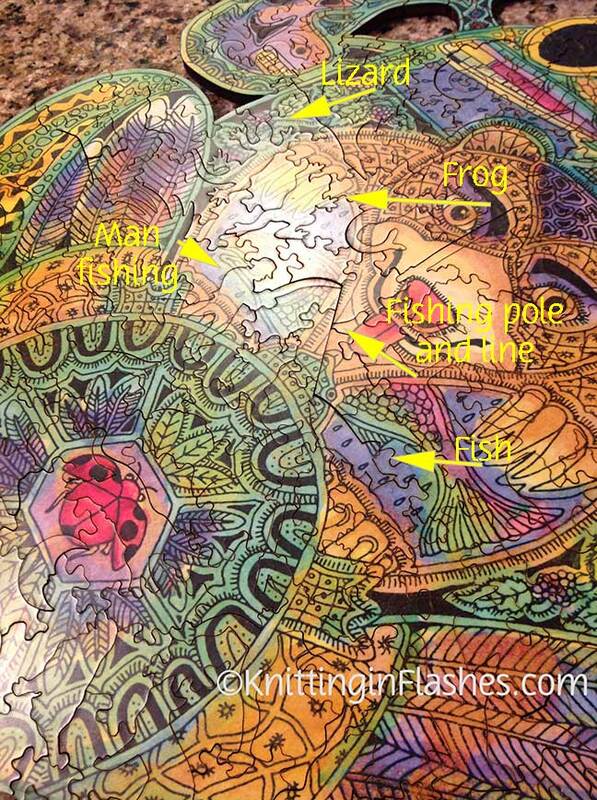 This entry was posted in Family, travel and tagged family, family fun, fun, jigsaw puzzle, puzzle, travel by Patti_is_knittinginflashes. Bookmark the permalink. That is an amazing puzzle. I do not like doing those, but do them to help my old brain! You don’t have an old brain! wow! I like puzzles, but that one frightens me. 🙂 It is amazing! It would have been fun putting it together on a glass top table so we could see the underside, too. Cool! We love puzzles. The girls are just getting into the bigger puzzles. We also play cards. I need to teach them rummy. Saturday morning, I make decaf coffee and we sit around the table, sipping coffee and playing cards. That sounds like my kind of fun…as long as I’m not on a team. I have a dozen or so puzzles “saved” in case we have visitors that are interested in putting one together. Mr. Aitch doesn’t do them. 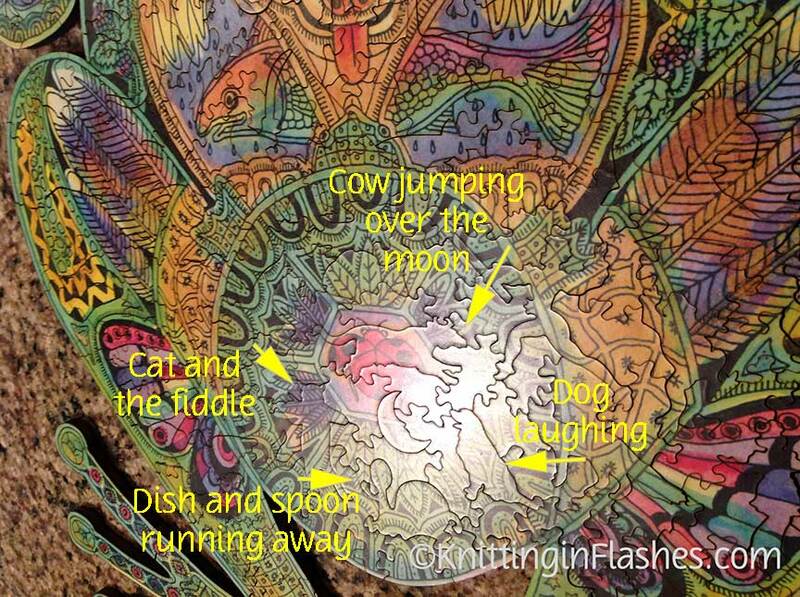 It was a cool puzzle…..but IT WAS HARD! It was fun! This looks awesome! I love puzzles. I just got a Harry Potter puzzle for us to do. After I got it, it occurred to me that the entire puzzle is pretty much in shades of black. 🙂 It’s going to be challenging! Oh, a very dark puzzle will be challenging! One of our neighbors had a puzzle that was a big red circle. No color variations at all.